Like many working photographers, Keith Cooper is self taught. Whilst it might stroke the ego to consider yourself as having some particular ability, in reality it’s hard work and practice that improve your photography. Keith has been looking at an interesting book that provides exercises and ideas covering all aspects of photography, from technical proficiency to developing one’s own style. Pages: 216 | Dimensions7.75 x 9.25in. It’s the start of 2018 and like many photographers I’ve been wondering what I might do to improve/advance/develop my photography skills and vision. A while ago I was asked if I’d like to have a look at Bert Krages’ book. My initial thought was that it would pretty much be a list of “try this” exercises of the sort I’ve seen that seem to think that you just need to go out and try a particular type of photography to somehow get better. However it’s so much better, in that the reasons for doing things are explored in a consistent and progressive way that I’m sure will be of benefit to many. First up, an overview of the book contents (from the publisher) gives a feel for the flow of the book. One of the most basic things I like to cover when I’m involved in any aspects of teaching photography, is the need to be able to properly look at what you’ve produced and decide in what ways (or not) it’s any good. The importance of just learning to see things cannot be underestimated. But, that’s the sort of stuff that frightens many photographers, so I was pleased to see a quick progression into some of the technical aspects of photography. I’ve long believed that a mastery of the technical side of photography makes it much easier to convert your thoughts and ideas into tangible photographs and prints. The whole point of understanding what exposure is all about, is that it and many other technical aspects of photography can, with practice, become almost automatic to you. I don’t have to think a lot of the mechanics of using shift lenses any more – it’s become about the images I want to create. It’s also important to try things so as not to just think you know something (about focus and depth of field for example) based on some supposed internet expert. Experience usually trumps internet ‘received wisdom’. Try the technical exercises – a desklamp and an egg really can teach you an enormous amount about the realities of lighting, shadows and reflected light. Do you actually know how long a shutter speed you can hand-hold with a particular lens? One of the exercises concerning light is to simply go out and take a series of photographs in the run up to and just after sunset. This really works. I did something very similar [the changing light as the sun sets] last year and it helped cement many aspects of lighting that I’d just assumed, even after quite a few years regularly taking such shots. I’ve been a pro photographer since 2004 and taking the time to do some of the exercises has been of real benefit. It’s one of the reasons I write the articles and reviews on the site – they give my testing some structure, and I need to be able to write about it afterwards. One simple example. I don’t do sports photography, so rarely need to capture much action. I’d never thought about the importance of negative space in such shots and how that, along with framing, could often help give the optimal time to press the shutter. Perhaps at some level I already knew this, since it seemed so intuitive once I tried it. This in itself covers one of the major ideas in the book, in that you may well know stuff (composition for example) without being able to explain it in words. It’s this disconnect between the intuitive non-verbal aspects of creating photos and the hard technology aspects of photography that frequently limits people getting more out of their efforts. The attention to cameras/lenses/equipment is quantifiable – and safe. One of the enduring messages I took away from the book was that you just need to keep on taking photos, and looking at images from all sources. I collect photography books from charity shops and the like, even if they are 50-60 years old – when asked why, my answer is simply that I like looking at the photos. I’ve lots of book of paintings too, of all periods. As an aside, for a ready stream of photos that are supposed to be great but usually leave me stone cold, try looking at a copy of the British Journal of Photography. A well written book that is packed with useful images to illustrate the matters at hand. It’s nice to see the author didn’t fall into the trap of only including ‘perfect’ photos – you will look at some and think ‘I could do better than that’ – good! It’s a book for people who want to take more photos and increase their satisfaction from doing so. Definitely one to try if you feel you’re perhaps clinging to some of the technical aspects of photography as a bit of a safety blanket, to avoid the fluffy artsy stuff. 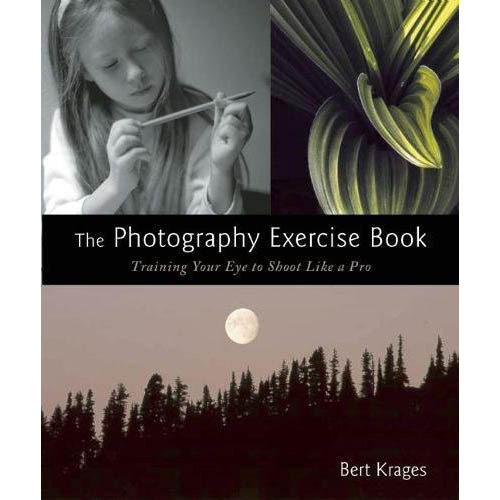 Bert Krages is a photographer and attorney who is the author of two previous photography books, Legal Handbook for Photographers and Heavenly Bodies: The Photographer’s Guide to Astrophotography. He lives in Portland, Oregon.